When I talked about my current read a few days ago, A Thousand Pieces of You by Claudia Gray, I mentioned that readers need to be able to suspend disbelief in order to follow the dimension-bending plot. I also said, “The pseudoscience tries to make the story believable, but it’s more like how you just need to give in to it like the Sandra Bullock film The Lake House – if you think about it too much, it all falls apart.” I made it sound like I was too good for this book. But who am I kidding? I did not give the author enough credit. Because guess what? I sort of love time traveling books! This isn’t quite a time-travel book – it’s alternate universes, but it’s sort of the same thing: our characters get dropped off in a totally new situation and they have to figure out how to fit in and how to get back home. I’ve loved this idea since junior high, when I read Both Sides of Time and the rest of the Time Travelers Quartet by one of my all-time favorite authors, Caroline B. Cooney. In the series, teenager Annie Lockwood gets sent back in time to the 1890s and falls in love with a young man and winds up at the center of a murder mystery. And just a few years ago, I was caught up in another great time-traveling love story: Outlander by Diana Gabaldon. Claire Randall, a nurse from 1945, walks through an ancient stone circle in Scotland and finds herself in the year 1743. In A Thousand Pieces of You, Marguerite travels through different dimensions in hopes of avenging her father’s murder. One dimension is super high-tech. In another, Marguerite is Russian royalty! In yet another, she lives in an underwater station because climate change has left much of the world’s population covered by water. The book is far-fetched, and there may be some naysayers out there who will not enjoy the dimension travel of A Thousand Pieces of You. There are a few unanswered questions about how it all works. But I don’t care! The characters and the story made up for those little inadequacies. I can’t wait to see what happens in the next book in the series, Ten Thousand Skies Above You. The titles are a bit grandiose, but will you just look at those covers? Come on, how could I not give them a shot? I recently took a break from editing my book and worked on some cover art. Instead of “borrowing” images from the internet, I decided to do some original artwork. My novel is a historical thriller that intertwines the story of Queen Elizabeth I with a modern tale, complete with puzzles. I wanted my cover to look modern, but hint at the history that is included within. First, I printed off some reference pictures. Queen Elizabeth I is pretty iconic, so I thought her image would look great on a cover. Next, I sketched out a design and colored it in. Afterwards, I scanned it into my computer so I could play around with the image. I tried out different layouts and fonts. I want the cover to be clean, but something that would interest me if I saw it on a bookshelf. As of yet, I haven’t hit on the winning design, but I’m enjoying the process. Now that I look at it, I think readers may get the wrong impression about the book – the Queen Elizabeth sections are much shorter than the modern day parts. I’ll have to rethink this and keep playing around. I also felt like my font choices were pretty limited. I’ll have to download some new ones soon. What about a book’s design makes you want to pick it up off the shelf? You know what would be an awesome bookish career? I think it would be pretty cool to be a book designer. I was curious to find out how one becomes a book designer and what the work is like. I enjoyed this article on Literally, Darling.com that interviewed Penguin Random House book designer Daniela Medina. She points out that it’s important to have a love of books and that understanding and being able to analyze literature is a useful skill too, as “It’s one thing to design a beautiful cover – which is difficult enough in itself – and it’s another to design a beautiful book cover that does real justice to the words inside.” Another interesting thing I learned is that a book designer is often working on multiple projects at once and they are always in different stages, so there is a lot of organization and project management going on. Jack Noel from Walker Books mentions this too in a post on The Reading Agency. He notes, “With many long-running simultaneous projects you need to be on top of it all, alongside dealing with artists, their agents and production costs.” His advice for young people who are interested in becoming designers themselves is to “Do what you can to learn the computer programs (InDesign and Photoshop, mainly) and create a portfolio – fill it with whatever you want – redesigned book covers, logos for friends, posters for bands that don’t exist. To be a designer you need a little bit of skill and a lot of enthusiasm and a portfolio of self-initiated projects is a good way to show both.” While it would be awesome to see your work come to life as an actual book, it would be tough to be creative all the time, continuously coming up with fresh concepts. This makes me appreciate all the work that goes into each cover. Don’t you love looking at the covers of books? I know you’re not supposed to judge a book by its cover, but let’s be real. Don’t you gravitate to the books that catch your eye on the shelf? It’s really too bad that you can only see the spines on a library shelf. They look so much more appealing when you see the full cover. Here are some 2015 and 2016 YA releases that have interesting and beautiful covers. I would definitely pick these books up to see what they’re about. How about you – which books are you intrigued by? Would you want to be a book designer? Entry #4 – Cover: I know they say “don’t judge a book by its cover,” but sometimes you can’t help it! Share a favorite. 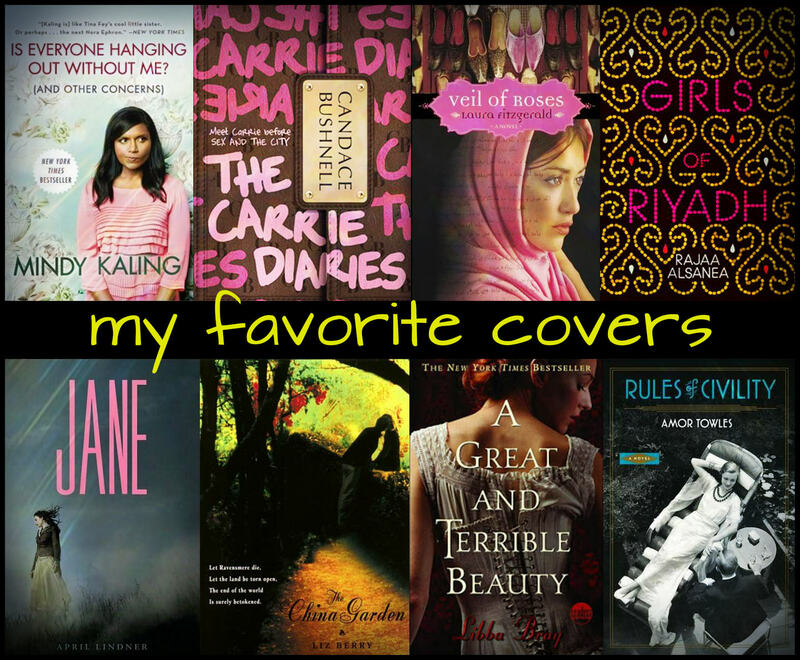 Pink seems to be a common thread among these covers, as does a young woman gazing off to the side! Is it bad that I’m drawn to pretty, girly images? Of course not. A lot of thought has gone into each of these covers. Designers, photographers, artists, and authors have worked together to create an image that will hook the right reader. Does my taste in covers mean I’m predictable and conform to the stereotypes that publishers are counting on? Maybe! But I’m not too worried about it. I’m being honest about what I like, and I do give other books a fair chance. Not every book on my shelf is a beauty!